A Taco Bell sensation gets Kogilicious. Consider this to be a horoscope for the L.A. food scene, but with less concrete astrological science, less fake accents in dimly lit rooms, and probably less accuracy. My ultimate goal is to predict the next big menu items from iconic local restaurants. If Plan Check debuts a kimchi poutine, I want you to have seen the idea here first. If Superba decides to open a gourmet cheesesteak shop, I want you to say, “Hey, didn’t that one guy write about it before it existed?” These are the foods you’re going to be noshing on in the future. (I hope.) This is Future Nosh. I’ve been a Roy Choi fanboy since jump street. That’s not hyperbole for, “I enjoy the man’s food on a regular basis.” It’s more along the lines of, “If there was a food-truck-con, I’d dress up in Kogi cosplay with a giant tortilla cape and a Super Soaker filled with gochujang and it’d get super weird and I’d get banned from the Bakersfield convention center.” Or something like that. I don’t think my feelings toward the guy are unwarranted; he’s been the single most influential figure in L.A.’s food scene over the past decade. Every restaurant in his empire—A-Frame, Chego, Sunny Spot, Pot, the soon-to-exist Loco’l—embodies the culture of innovation and inclusion that’s become the trademark of LA dining. But after global warming consumes the planet (or the apes take over and exact revenge on the human population, whichever happens first). Choi’s most important mark left on food history will undoubtedly be Kogi BBQ — the four-wheeled mecca of fusion tacos. But Kogi’s also constantly innovating within that frame of authentic personal experience. This year alone, Choi’s come out with chilaquiles, wet burritos, and the three-meat Pac-Man burger, all of which are resoundingly awesome. So, what’s next? 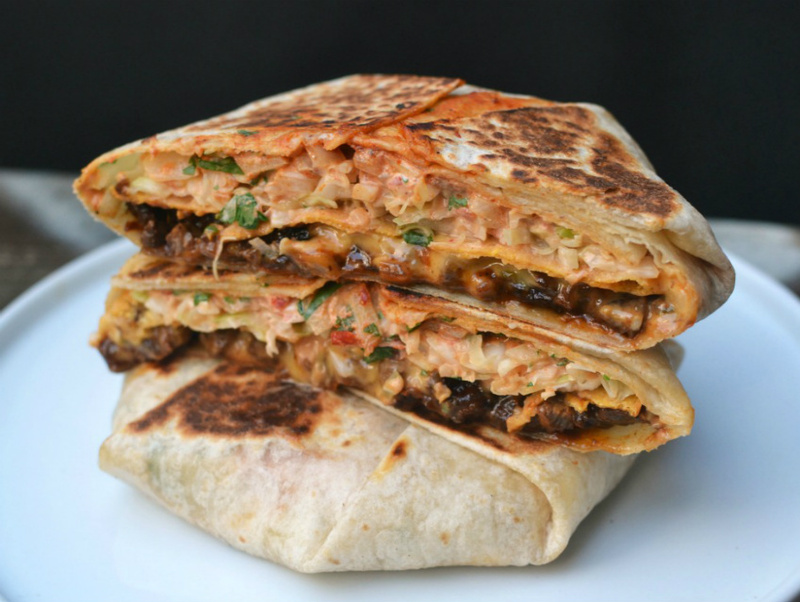 What further combination of tortilla-wrapped Korean goodness can Kogi create? To answer this question, I looked to an unlikely source for culinary inspiration: Taco Bell. Say what you want about the establishment, no one can debate the fact that they do some wildly creative stuff with the humble tortilla. And where did the Bell go after they exhausted their creative limit on tacos, taquitos, burritos, and tostadas? The six-sided modern marvel of edible pseudo-Mexican architecture: the Crunchwrap Supreme. Your typical Crunchwrap—insofar as a Crunchwrap can be typical—has a layer of ground beef and nacho cheese, topped with a tostada shell, and finished with shredded iceberg lettuce, diced tomatoes, and sour cream, all enshrouded in a hexagonally folded and griddled flour tortilla. For the Kogilicious version, I tried to stay relatively true to both roots. It all started with some double-caramelized short ribs that’d been marinated in soy, sugar, garlic, and bird’s eye chiles. I topped that with some kimchi nacho cheese, which infused the fermented cabbage into a cheddar-jack laden béchamel (someone needs to copyright this immediately), and crowned it with a tostada shell. Sitting on top of the tostada shell was a cabbage slaw with rice vinegar, cilantro-and-onion relish, sambal sour cream, and a hot sauce made with guajillo chiles and gochujang. This whole monstrosity was wrapped up in the signature albeit totally arbitrary hexagonal shape, then griddled off to sear in maximum flavor. Roy, Mr. Choi, dude, if you want to purchase the idea, all I’m asking for is $20 and 10 minutes alone inside one of the Kogi trucks.